House Speaker Paul Ryan’s announcement that he plans to give up his gavel at the end of this Congress without waiting to see if voters tear it from his grasp in November wasn’t a total surprise; it had been rumored for months, despite regular denials from his camp. But its occurrence at this particular moment, with the GOP struggling to hang onto control of the House, and with the perpetual restlessness of House conservatives never far from the surface, could be more than a little problematic. “This is a Titanic, tectonic shift … This is going to make every Republican donor believe the House can’t be held.” The announcement will help Senate Majority Leader Mitch McConnell (R-Ky.) in his fundraising because “the Senate becomes the last bastion,” the Republican said. From this perspective, Ryan’s retirement is an effect rather than a cause of electoral agony for his party. But talk among donors of writing off the House as a lost cause this early in the cycle could represent a self-fulfilling prophecy. Beyond November, Ryan’s self-defenestration could return House Republicans to the state of constant factional conflict in which they lived during the tenure of his predecessor, John Boehner. 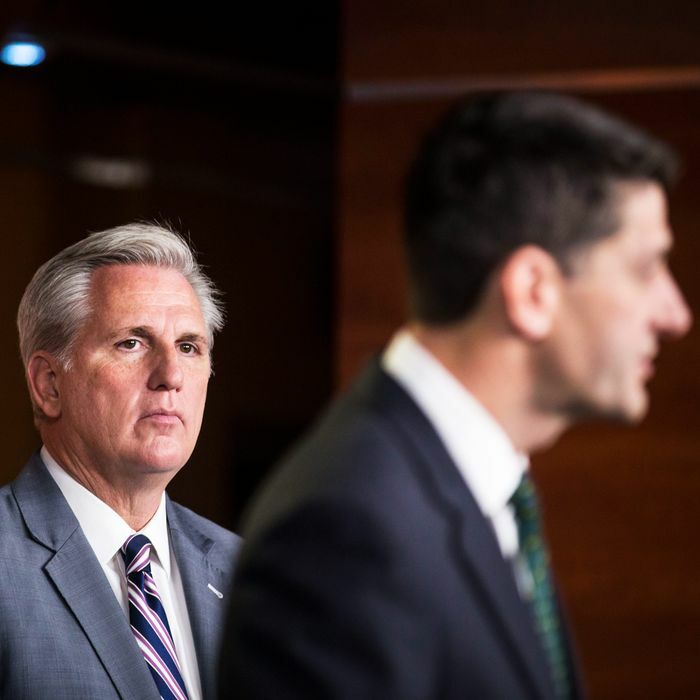 A leadership contest, most likely featuring Majority Leader Kevin McCarthy of California and Majority Whip Steve Scalise of Louisiana, will soon ensue unless the latter decides to defer to the former’s seniority. Even then, McCarthy must prove himself acceptable to the conservatives who derailed his speakership campaign in 2015, or he could fall short of the votes he needs to win the gavel, paving the way for Scalise, who is perceived as being more ideologically rigorous. The California Republican has a lot going for him that he did not three years ago, most notably his tight relationship with President Donald Trump, who calls him “my Kevin.” If Trump endorses McCarthy for the job, as McCarthy allies think he would, the president’s sway with conservatives could help seal the deal. Whether or not they back McCarthy, conservatives will continue to hold disproportionate power in the House GOP conference, and that power would be enhanced by a poor general election showing this year, a result more likely to befall modestly conservative members in swing districts. You’d think three years of leadership from the famously conservative Paul Ryan would have reduced the extremist pressure on House Republicans. But then Ryan, after all, was mostly defeated in his career-long assault on the welfare state. And if there’s one thing most conservatives believe, it’s that the answer to conservatism’s failures is to keep moving to the right.